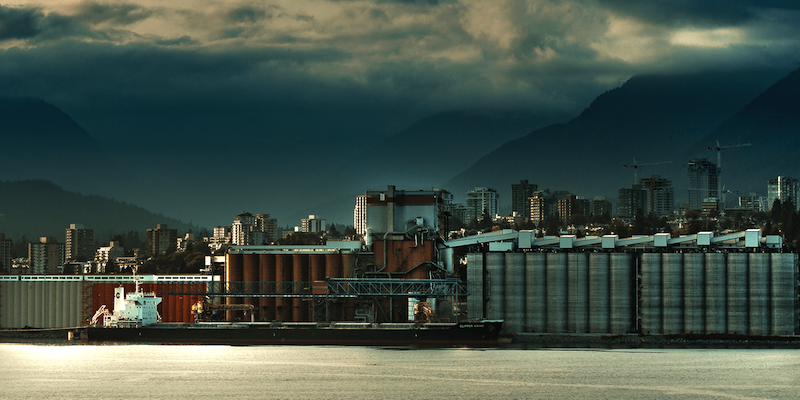 As Canadian grain companies spend millions to upgrade and build new export terminals in Vancouver, a new problem is threatening to cause transportation bottlenecks at the nation’s largest port: vessels can’t load grain in the rain. And it rains a lot in Vancouver. In Canada’s wettest major city, the practice of loading ocean-bound vessels with grain in rainy weather has been halted since January amid safety concerns for marine crews. Every time there’s a wet period, crews stop loading and wait for the skies to clear. “Vancouver terminals are generally operating on and off as the rain keeps starting and stopping,” said Wade Sobkowich, executive director of the Western Grain Elevator Association, which represents the nation’s grain shippers, including Richardson International, Cargill and Viterra, Glencore Plc’s Canadian grain unit. Earlier this week, “there were significant weather delays during the loading process” due to the rain. The potential delays come as the port city heads into the wettest time of the year and as grain shippers seek to move large volumes of recently harvested crops including wheat and canola. November through January is the rainiest period of the year in Vancouver and there’s a chance this winter could be warmer and wetter than normal if El Nino conditions develop, said Matt MacDonald, a warning preparedness meteorologist with Environment Canada. Rail transportation bottlenecks led to piles of commodities being stuck on Canada’s Prairies last winter, including grain, oil and lumber. While total Canadian grain shipments have been moving at a faster pace this season, there are concerns rain could serve as another potential disruption. Total Canadian grain exports through all ports have surged 9.3 per cent to 18.7 million tons between August and early December, up from 17.1 million tons the year earlier, Canadian Grain Commission data show. Up until last winter, marine crews would pour grain through feeder holes in the ship’s hatch cover during inclement weather or place a tarp over the hold, leaving a small opening for a loading pipe to drop in the grain. Grain needs to be protected to prevent it from getting wet, which can cause it to rot or sprout in transit. The practice was halted earlier this year after an arbitrator ruled guard rails must be erected when crews are loading vessels in the rain to prevent falls, said John Beckett, vice president of training, safety and recruitment at the British Columbia Maritime Employers Association. The union representing longshore workers has also raised concerns regarding electrical grounding and staffing levels, and those issues still need to be dealt with before crews resume loading in the rain, he said. The impasse has so far been an “irritation” and has not had an impact on grain movement, said Mark Hemmes, president of Edmonton, Alberta-based Quorum Corp., a company hired by the federal government to monitor Canada’s grain transportation system. The stoppages don’t often create congestion, though there is the potential it could if the city gets above-average, heavy rainfall, he said. So far, the temporary stoppages in vessel loading haven’t affected the fluidity of grain movement and the industry is keeping up with rail car deliveries and unloading cars, Sobkowich said. There are hopes that trials involving the new safety equipment could start in the new year, he said.